On Thursday, January 25, Georgia Tech’s CREATE-X hosted athletic director Todd Stansbury and assistant athletic director of innovation Doug Allvine as part of a discussion on innovation and entrepreneurship at the intersection of sports and technology. AD Stansbury began by discussing his work with student-athlete startups during his tenure at Oregon State, pointing out two major projects in particular: a social media marketing consultancy oriented towards small businesses without the capital to build their own online brands and a digital media firm built around exposing fans to the athlete experience. Stansbury went on to take questions from both the CREATE-X moderator and the crowd about Georgia Tech’s investment in sports-tech and how Tech will help shape the future of the industry. Stansbury made some of his most poignant comments in the back half of his session, discussing a variety of topics concerning Tech athletics’ application of analytics in its internal processes and its adoption of modern sports-tech. Stansbury noted that working with Atlanta United and hosting soccer matches at Bobby Dodd Stadium made GT staff aware that “(t)here’s a sports fan out there that’s totally different than the ones…we typically try to sell to”. There’s a younger population out there that takes MARTA to Midtown bars instead of driving to a Tech parking lot and tailgating for four hours before a game in a spot that they’ve hung out with family, friends, and neighbors in for upwards of 20 years. GTAA now has the challenge of connecting with that demographic, some of whom may never have heard about Tech before, and bringing them into our arenas for games. Stansbury went on to emphasize that Tech has to sell tickets: when people talk about the big-names in college athletics - the Alabamas, the Ohio States, the Michigans - “you don’t have to sell them a ticket, they just tell you when tickets are available”. Tech has to work to create relationships with fans around Atlanta (and around the country), battling existing college affiliations and four successful pro teams for attention in a crowded media market. The task of selling tickets is further confounded by the dispersion of Tech’s alumni; it’s easy to get an alumnus that lives in the Southeast to a Tech game, but what about ones that live in, say, South Dakota? It’s harder to convince them to buy season tickets because it’s just not worth it to them because of the distance from campus. That’s why, Stansbury mentioned, “we’re trying to move from transactional (ticket sales) to relationship (building)”. 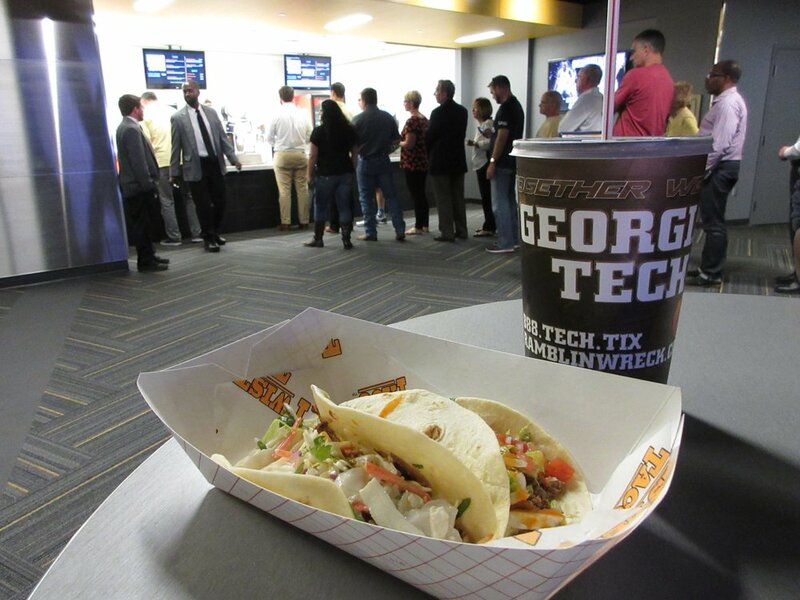 To do so, Tech has partnered with local startup Experience to create a sort-of “Ramblin’ Wreck pass” - a membership program for donors that helps them choose how they engage with GTAA in a manner that’s best suited for them. Stansbury emphasized that “Everything that we do is being analyzed…we have a 3rd party in Sodexo and sometimes that complicates matters, but that’s not gonna stop us from analyzing things”. This constant analysis allows athletics to modify prices and offers based on engagement. But he admits that fan engagement at Tech is a different beast than at other schools: “since we have (pro teams around) and are in the oldest on-campus stadium, we have to make the most of what we have”. GTAA realizes that only offering one type of experience or benefit may not be best for all fans, and only having three types of seats available (bench-level, club, and suites) confounds this issue. The challenge for GTAA moving forward is designing different experiences for different fans, and as Stansbury mentioned, the Athletic Association is looking at all available space in Bobby Dodd Stadium and looking at how they can turn it into a fan amenity. The goal is to offer a wide variety of experiences that not only drive alumni and student attendance, but also draw the eye of people off the street. Stansbury explained that football drives most athletic programs’s ‘economic engine’, creating almost 75 to 90% of total departmental revenue. At Duke and Kentucky, basketball may produce a lot of supplementary revenue, and sometimes a third sport like hockey or baseball generates some revenue, but this isn’t always the case. When you’re talking about maximizing revenue, generally you’re looking at football and basketball, but other sports can maximize opportunities for other things, like wearables, performance tracking, etc. Stansbury claimed that when thinking about how to maximize revenue from non-revenue sports, “it ends up being a return-on-investment problem”, and Athletics has to determine “what can (it) do the move the needle” for a sport, whether that be investment in equipment, facilities, etc. In most cases, “you know, winning changes things”. He cited the success of Oregon State’s non-revenue sports; they won titles and increased their revenue, which underlines the importance of analyzing which sports you can ‘move the needle’ and innovate in to increase your probability of success. Tech’s TV exposure and competitiveness in the ACC affects its brand exposure, and poor performances on a regional (and sometimes national) stage cast Tech’s brand in a poor light. Stansbury equated Tech to Stanford, hypothesizing that prospective student-athletes always look to Stanford “because they’re good at everything”. In his mind, there’s no reason why Georgia Tech shouldn’t be good at everything like Stanford. The resources are here, but Tech just has to put them to use. Stansbury emphasized the role of technology in recruiting and training athletes to help neutralize advantages other schools have over Tech. With the Dukes and Alabamas of the college athletics world bringing in recruiting classes full of five- and four-star athletes every year, how does Tech compete with its seemingly-measly classes of three-stars? Stansbury argued that “being able to spot talent and analyze talent can be a great equalizer”, helping Tech’s recruiting staff pick out quality athletes that might be the 10th or 11th-best player at their position in the state, but have statistics and ability that project to high levels of success in college ball. Additionally, Athletics can utilize training technology that helps “make sure that our kids in their 3rd and 4th years have developed enough to compete versus those…(one-and-done) phenoms” in basketball and whole platoons full of bigger, stronger underclassmen in other sports. Stansbury noted an overwhelming concern for athlete privacy and an abundance of unanswered questions when it comes to healthcare data and analytics using wearables, referencing the comments of a ACC student-athlete representative at the 2018 NCAA convention. He later clarified, “We can know when our student athletes are asleep…when they are supposed to be in class…there is some concern at the student-athlete level over how this is gonna be used”. Will this kind of technology be used to simply train athletes harder or keep them under a tight leash? The application of wearables in collegiate sport (and professional sport, to an extend) begets an important debate on how their data will be interpreted and applied. Stansbury went on to emphasize that Tech would vet the possible applications of wearables before integrating them into athletic processes, adding that “(the) NFL is way down the road in accumulating all kinds of data, but they’re purposely not using it because they don’t know what the unintended consequences will be”. Everyone is treading very carefully in this realm to avoid opening a Pandora’s Box of problems. Another issue GT Athletics is facing is processing the vast amounts of data from these devices. Stansbury explained, “We’re accumulating data so much faster than we can absorb it…(we) don’t have an analytics department who can crunch on this data and teach coaches how to use it”. The next challenge for Tech is creating actionable insights from this data - as Stansbury mentioned later on, “We have 8 different systems that our coaches are using, but the time they get the data, practice is over”. How does GT athletics take that next step and generate decisions, lineups, or playcalls that their coaches can use? Stansbury finished his panel with a discussion of the innovation scene in Atlanta, mentioning that one of his first tasks as athletic director was to hire Doug Allvine to do an “innovation audit” of the city. Allvine (now assistant athletic director for innovation) cited the immense technological talent in the city, the large investments other firms have made in new campuses and offices in town, and the interest of professional franchises and other corporate partners as prime factors that poise Tech and Atlanta for rapid growth in the sports-tech space. Stansbury added that “every pro team wants to…engaged in innovation”, and that they want Tech to be the hub for it, a movement that began with faculty research presentations to pro teams and Adidas last month. With regards to partnering with Adidas starting in July 2018, Stansbury added, “(Adidas wants) to bring manufacturing closer to the markets…we believe we can play a role in (Adidas’s plan to change how sports apparel is made in the US),” going on to explain that Tech was a top target for Adidas because of its materials science and engineering background and Atlanta’s reputation as an entertainment capital - it was the right mix of engineering and entertainment that Adidas wanted to invest in and develop, providing Tech with unique opportunities. Stansbury went on to mention Adidas’s construction of the ‘Speedfactory’ automated manufacturing facility: “Geography is important and the fact that we are 30 miles from the Speedfactory” will help Tech a lot. He explained that while Oregon State wasn’t Nike’s flagship school in the state, the university’s proximity to Nike still got them access to pre-release products and technology. “We are surrounded (by innovation in Atlanta),” Stansbury concluded, emphasizing that if Tech takes advantage of its unique situation, then it will be set for the future. Stansbury’s comments at CREATE-X assure fans that Georgia Tech is firmly invested in sports-tech in its athletics program. GTAA intends to tightly couple technology and the athletics program, wielding a strong partnership with Adidas, the devout interest of Atlanta’ professional sports franchises, Atlanta’s burgeoning reputation as a technological hub, and support from Tech academia to seek out innovations to make our program more efficient and better at what we do. Considered together, these factors create a huge potential for growth and innovation for athletics heretofore unseen across the nation. Arguably the most important point Stansbury made during his session focused on the Georgia Tech brand. He touches on a common pain point for the vast majority of Tech fans: why CAN’T Tech be like Stanford? Why CAN’T we recruit the brightest students AND the best athletes to the Flats? Stansbury cites winning as the main ingredient in a successful brand like the Cardinal, and I’m inclined to agree: successful programs produce a self-fulfilling prophecy: program success begets good recruiting classes, which beget more program success. But Stansbury makes it a point to involve the strengths of the Institute in building a successful program: by making use of Atlanta’s startup and tech culture, the high technical aptitude of the Institute’s students and alumni, and the Institute’s various corporate connections, Stansbury and co. can create a culture of technological innovation and emphasis on resource efficiency within the athletic program. He admits that Tech isn’t a top destination right now and because of that, “we can’t be lazy…we have to be smarter about how we do things” - we have to make the most of the resources we have right now. We have to rely on number-crunching and analysis to make the best decisions for our program, whether that be in maximizing ticket revenue or recruiting the state’s best athletes. We have to incorporate new methods and software that help our athletes train better and recover from injury faster. Integrating new technology into our athletics processes is how we help our scrappy teams of 3-star recruits upset squads filled to the brim with vaunted 5-stars. Tech is known as a hub for technological innovation - why not bring that expertise to our athletics program? Stansbury’s technocratic approach is a refreshing take on the winding saga of Georgia Tech athletics. Even with its high academic standards for athletes, Tech has always had the potential to become an athletic powerhouse like Stanford - we’re in one of the best and fastest-growing cities in America, we have a top-class academic reputation, and we have a tradition of success in the classroom and industry. Now, with Stansbury at the helm and a renewed emphasis on technology and innovation in the athletics program, we have the opportunity to build a tradition of winning on the Flats. h/t to CREATE-X for putting on this event!